If you are looking for stylish, contemporary, environmentally-friendly furniture for your nursery, look no further than Oeuf. This Brooklyn-based husband and wife design duo – named after the French word for egg – serve up adorable kids clothing and furniture that are as easy on the eyes as they are on the planet. My favorite design on the Oeuf menu is the ‘Classic Collection’ of baby furniture. Featuring a matching dresser / changing table, a movable changing station, and a crib that converts to a toddler bed, Oeuf’s versatile 3-piece collection will stylishly and sustainably cover all your baby furniture needs from birth until kindergarten. The Oeuf Classic Crib can cradle your newborn from birth to age 5 with the Toddler Bed Conversion Kit – a kit which turns the beautiful classic crib into a modern bed for your growing child. And the crib isn’t the only product in the Oeuf Classic line with a thoughtful approach to long life and multi-functionality. The matching dresser is easily converted into a changing table by setting the changing station on top of it. 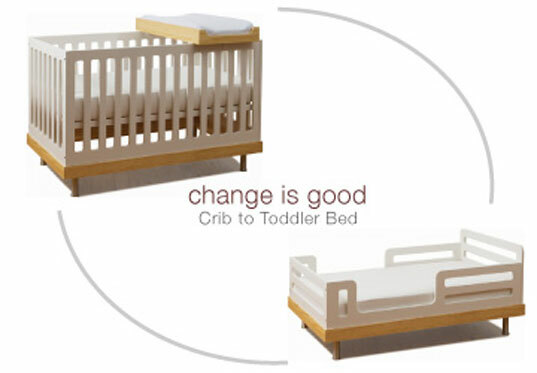 The versatile changing station can also be fixed to the top of the crib for another option in diaper changes. But versatility and design for long life cycle aren’t the only eco-friendly aspects of the Oeuf Classic Line. Comprised of solid FSC-certified wood (walnut or birch), environmentally-friendly MDF from recycled wood fibers, and non-toxic, no-VOC finishes, each material that goes into the Classic Collection furniture is carefully considered for health and sustainability. When it’s your little one we’re talking about, and only the best will do, look to Oeuf for all of your eco-chic nursery needs. When it comes to baby furniture, it doesn’t really get any better than this. I have both for 18 month now. I'm quite happy of the crib, but the chest of drawers is extremely dangerous. If you open 2 drawers at the same time it tilts down. It happen to me while I was changing the baby. I was lucky enough the baby was not harmed, but my feet were not that lucky. I wouldn't recommend this chest of drawers. Eco-friendly furniture meets the cubicle culture Buying eco-friendly desks, chairs, cabinets, space dividers, and other furniture is getting easier. With government agencies, universities, and corporations specifying greener products, furniture makers have been fairly quick to put environmental options on the table. Both large and smaller companies offer furniture made from sustainably harvested woods and recycled, bio-based, or nontoxic materials, and made with glues, paints, foams, and other ingredients that don't give off noxious odors. If you are looking for stylish, contemporary, environmentally-friendly furniture for your nursery, look no further than Oeuf. This Brooklyn-based husband and wife design duo - named after the French word for egg - serve up adorable kids clothing and furniture that are as easy on the eyes as they are on the planet. My favorite design on the Oeuf menu is the 'Classic Collection' of baby furniture. 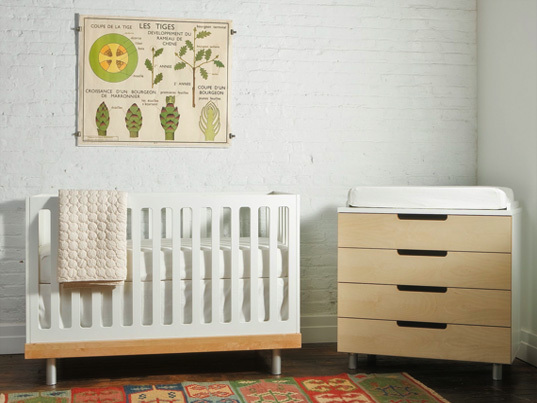 Featuring a matching dresser / changing table, a movable changing station, and a crib that converts to a toddler bed, Oeuf's versatile 3-piece collection will stylishly and sustainably cover all your baby furniture needs from birth until kindergarten.